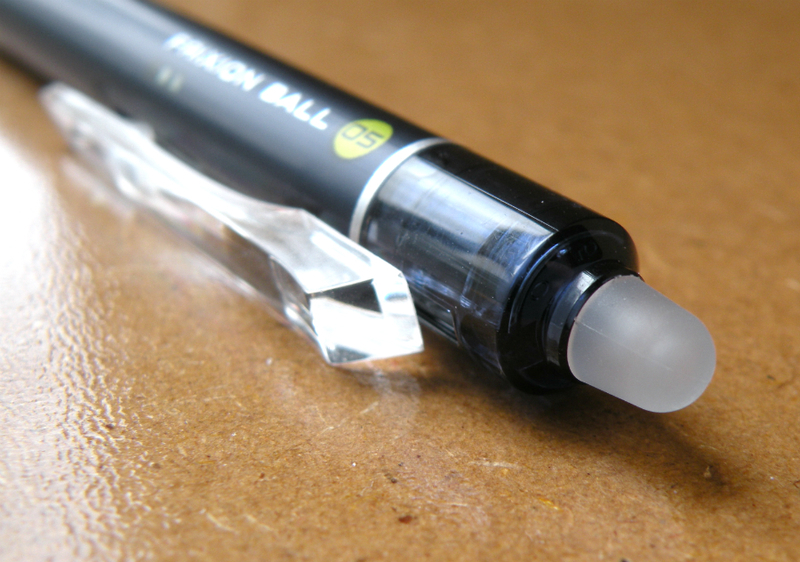 You want to talk about a pen I really can’t improve much on, it’s this exact pen—the Pilot FriXion Ball Knock. 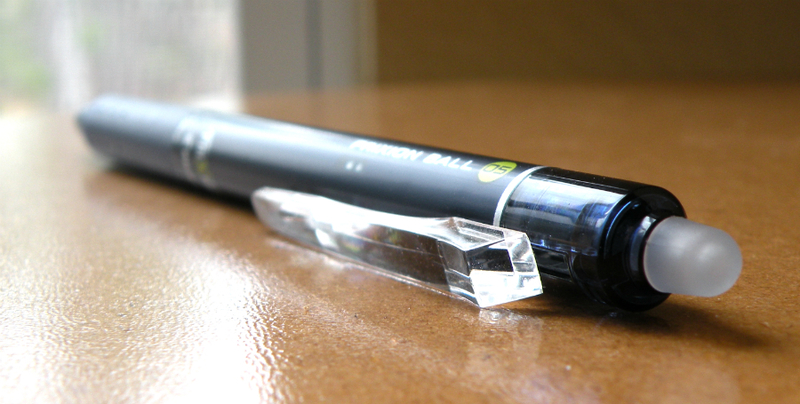 It’s a retractable, erasable gel with a nice design at an easy price point. 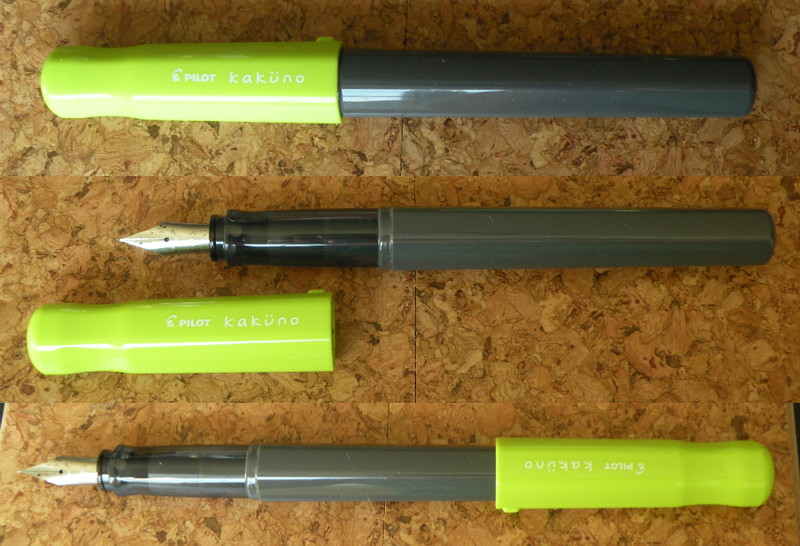 The body is simple, professional, and color-coordinated to the color of the ink. The only detracting feature is that the back side is covered in Japanese (instructions, probably) printed on the body—would have been better to have all that printed on an easy-remove sticker. 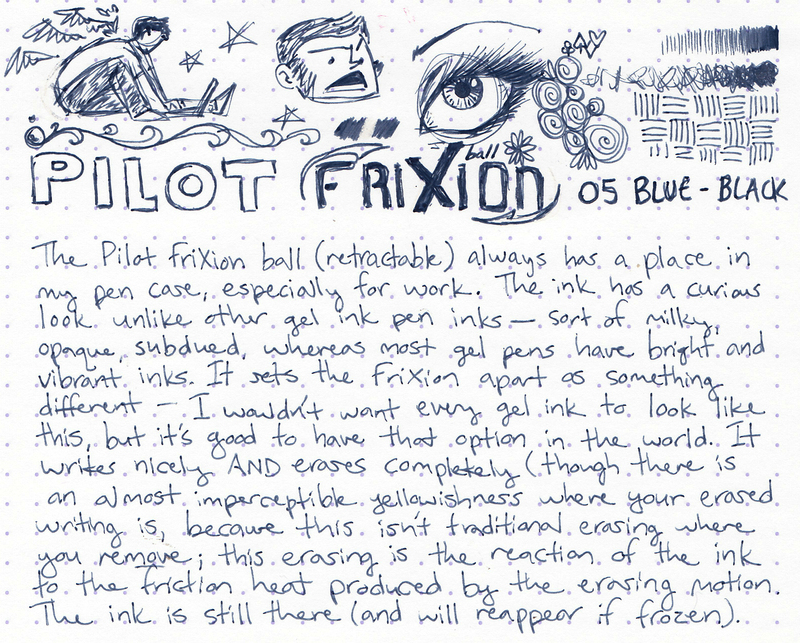 What makes the FriXion so much better than the erasable pens of my youth is that the erasing isn’t accomplished by removing the material off the page—instead, the friction created by the act of rubbing/erasing generates enough heat to cause a reaction in the thermosensitive ink, changing the color to an almost imperceptible near-white, effectively erasing the ink. This process means no eraser crumbs. 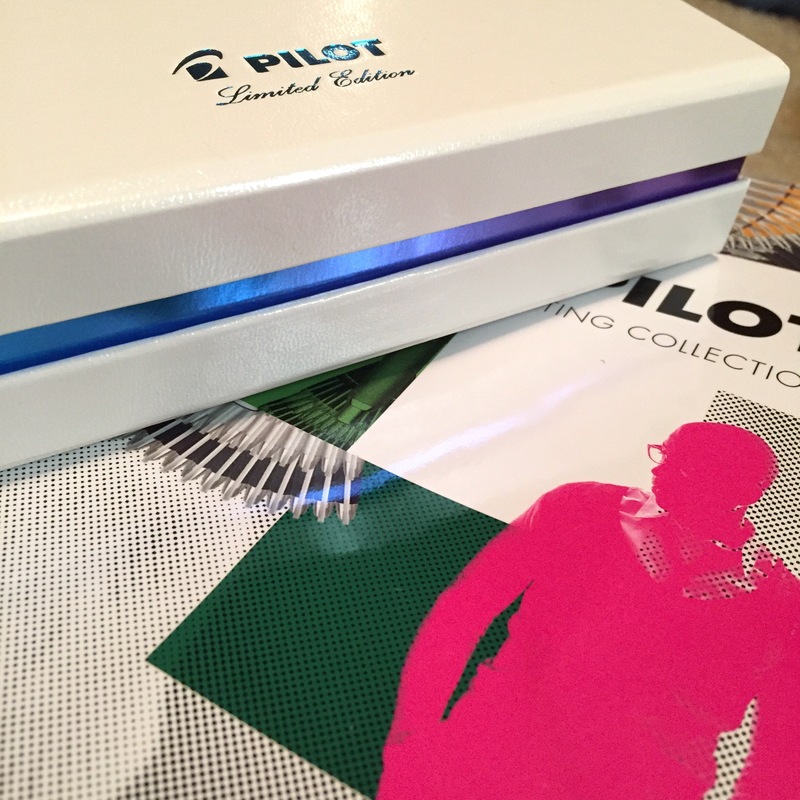 And this design means none of the problematic situation of the Pilot FriXion Point, whose cap, when posted, would block the eraser. Bravo, design team. The grip is simple, streamlined with the body. Might I suggest a deluxe model with a luxuriously squishy grip be added to the FriXion lineup? Ultimate student model? The goods! There are some things you need to know about the FriXion gel inks—they will never be as bright and vibrant as typical gel inks—every color, even the black, has a subdued, muted, almost milky opaque quality to it. 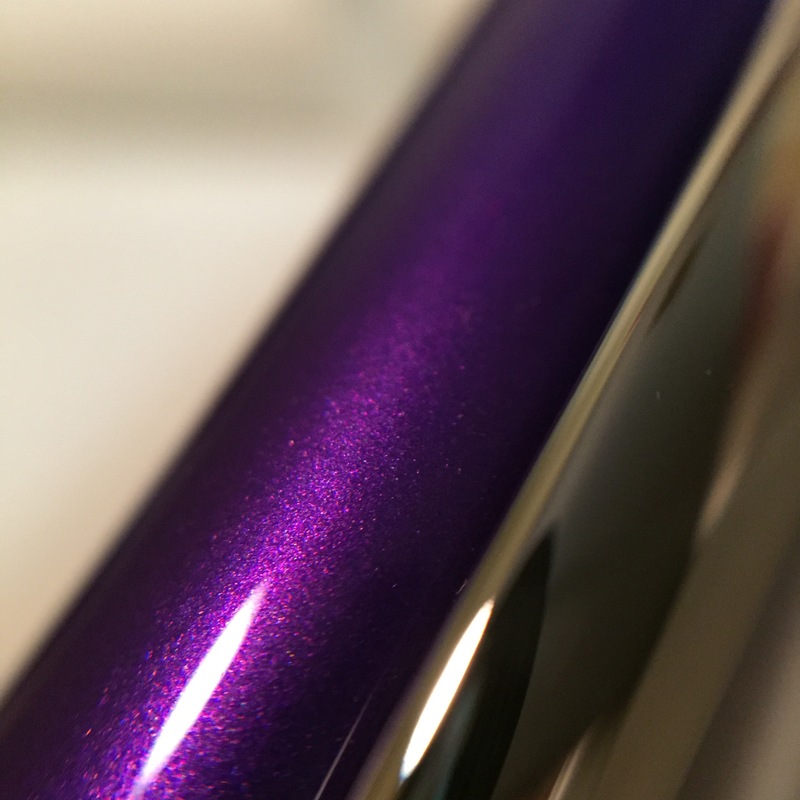 It looks lovely, but if you want those strong, bright colors then the FriXion line may disappoint you. 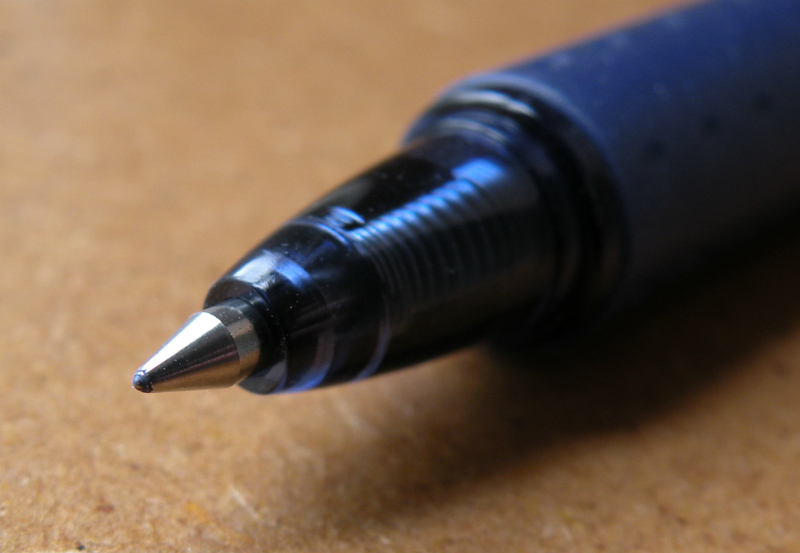 Next note: if you press hard into the page when you write, yes, you will still be able to see the indentations of your writing. 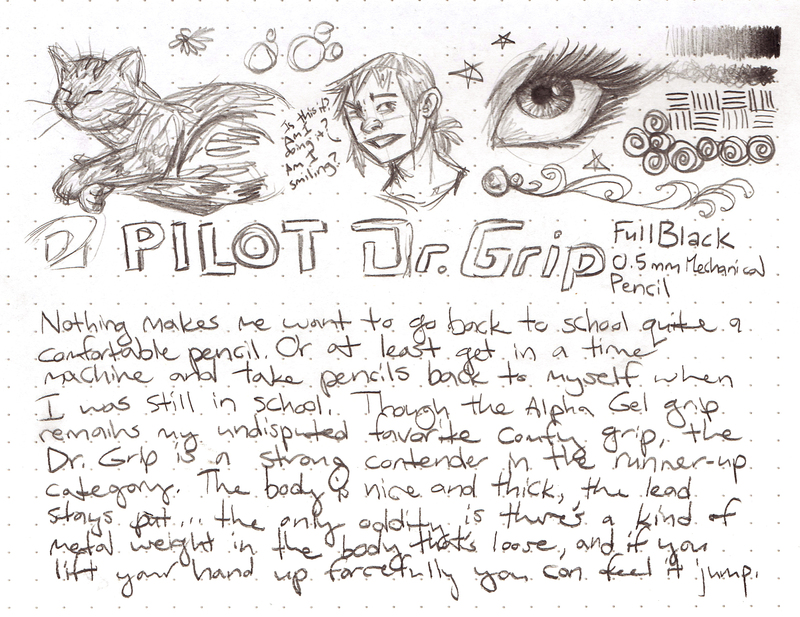 The eraser is neither magic nor anti-gravity, but I imagine this is also a problem for pencils, so I wouldn’t hold it against the FriXion in particular if a heavy-handed writer is you (but perhaps consider a larger diameter tip, like the 0.7mm). 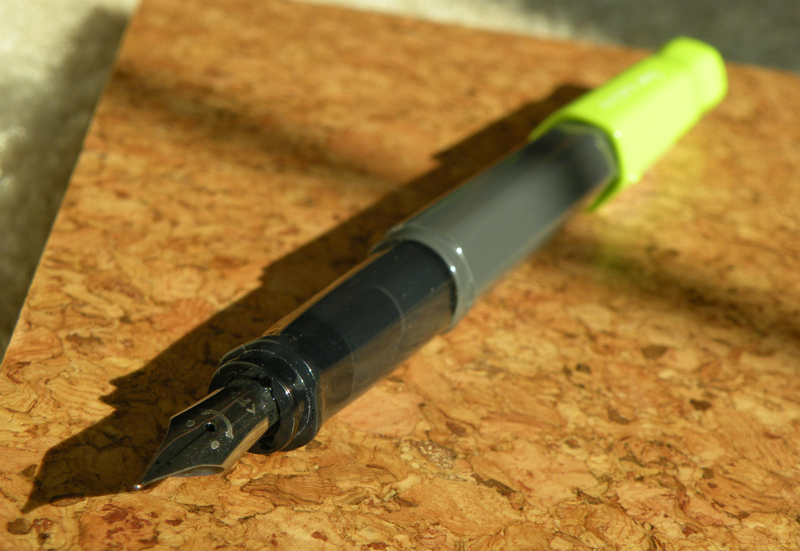 All that said, I find the FriXion writes smoothly with almost no pressure needed. 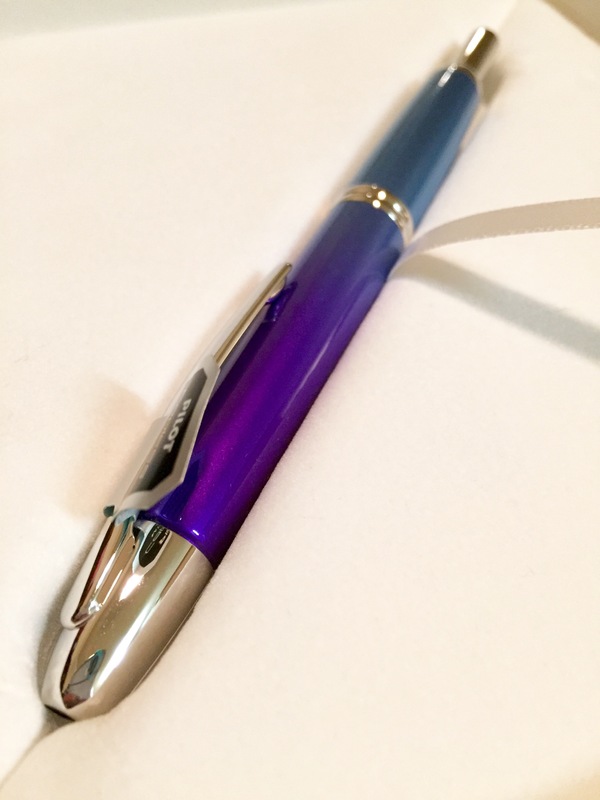 I love using this for taking notes, between the writing and the erasability—just make sure you don’t leave them in, say, a hot car (either the pen or the notes) or you’ll have to stick them in a freezer to bring them back from invisibility. The only possible suggestion I’d add is roll out a needle-point version. Because heck, why not? Gloomy lighting brought to you by the weather! 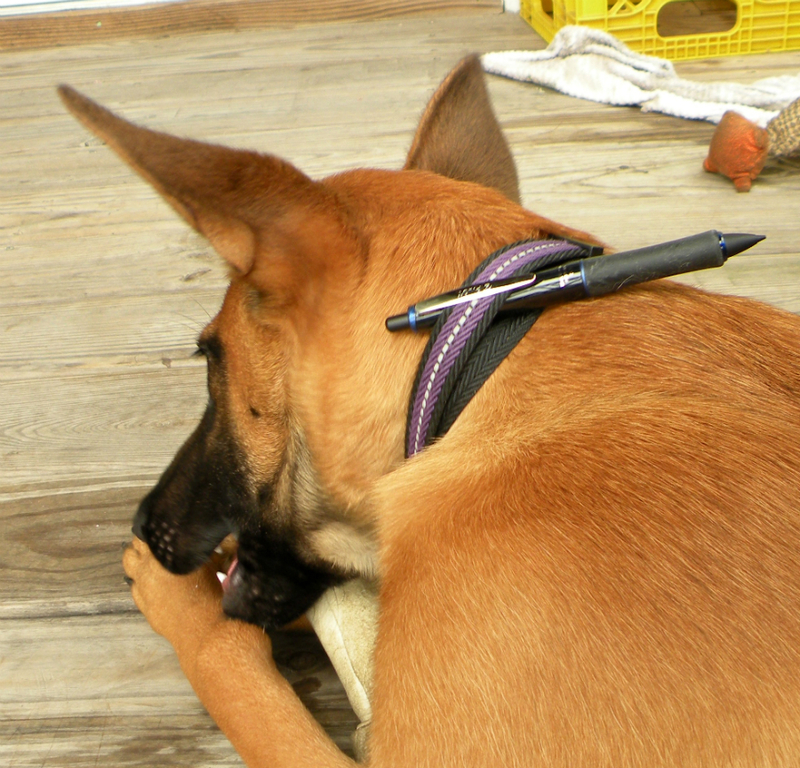 Cooperating with my pen pictures since never. 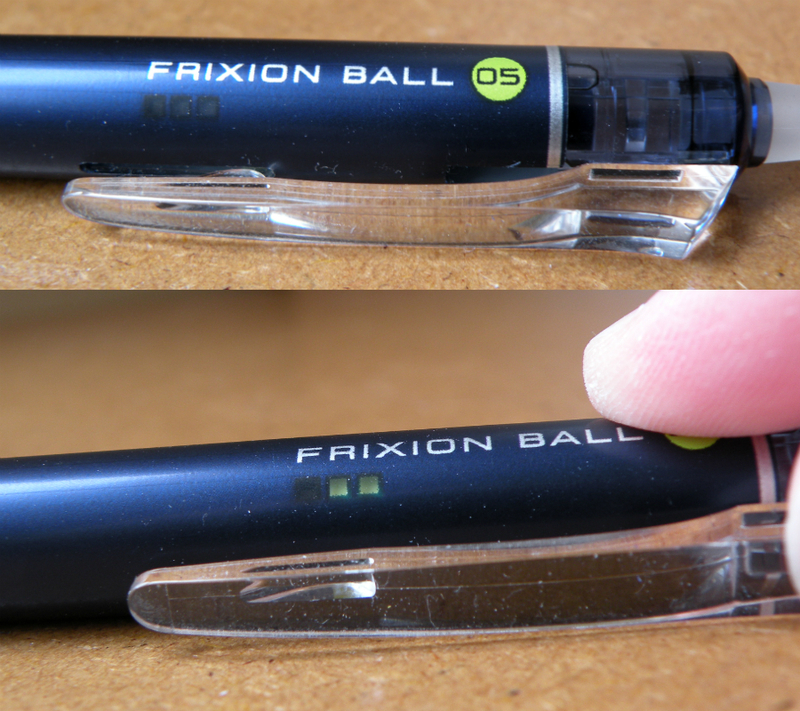 There will always be room in my pen case for a Pilot FriXion Ball Knock. 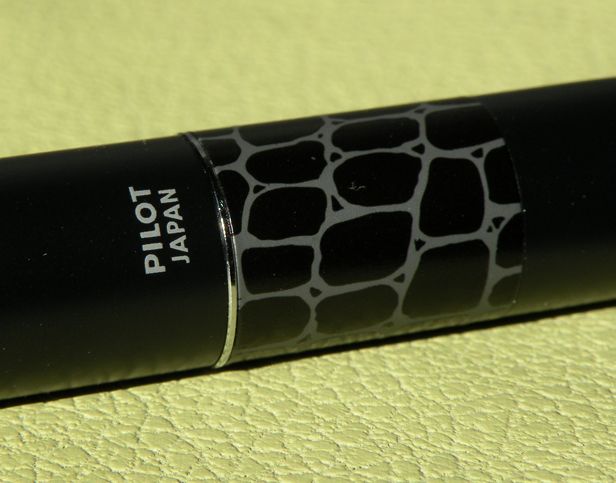 Thanks to JetPens for providing this sample! 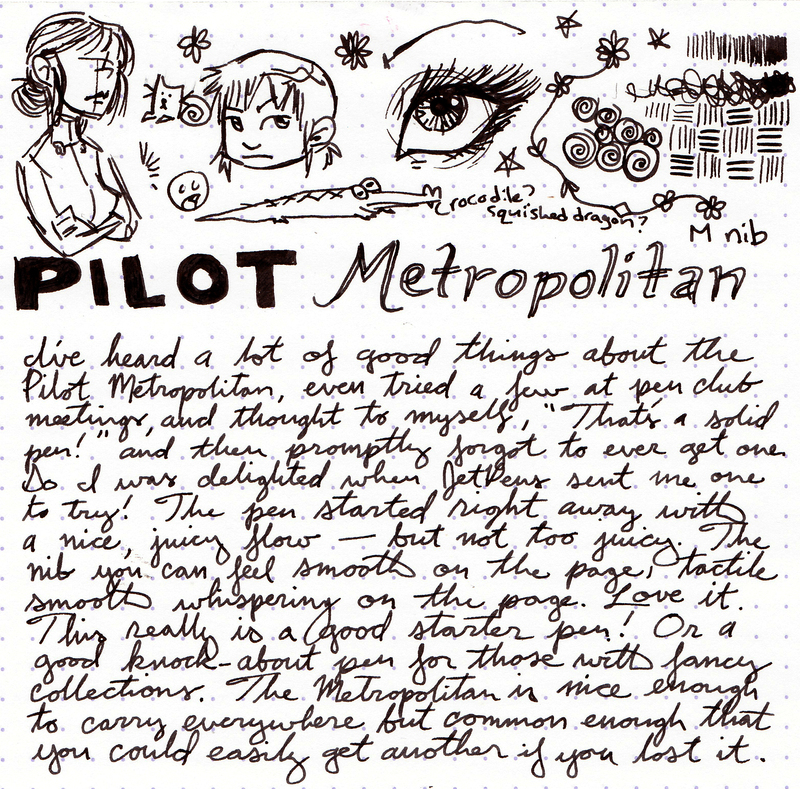 The Pilot Metropolitan has been on my radar for a while—I’ve heard good things about it, even got to try it a few times at my local pen club meetup. 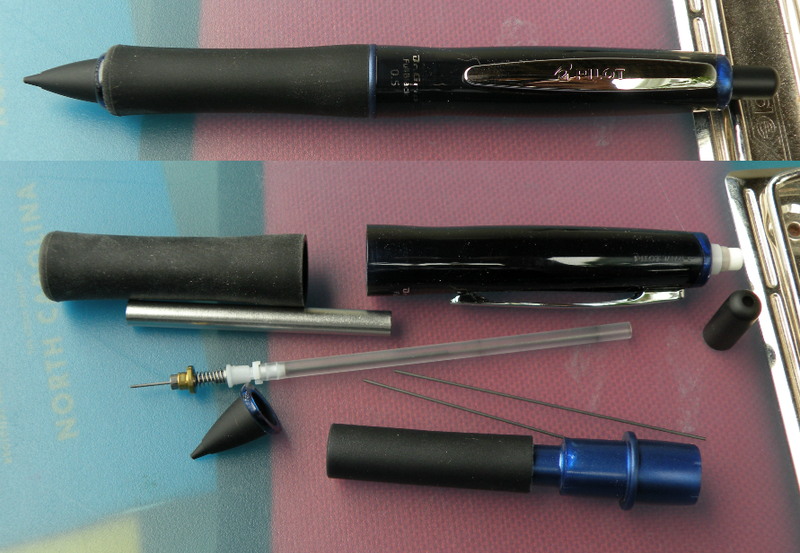 Every time, I’ve thought, “What a solid pen!” and then promptly forgot to get one. 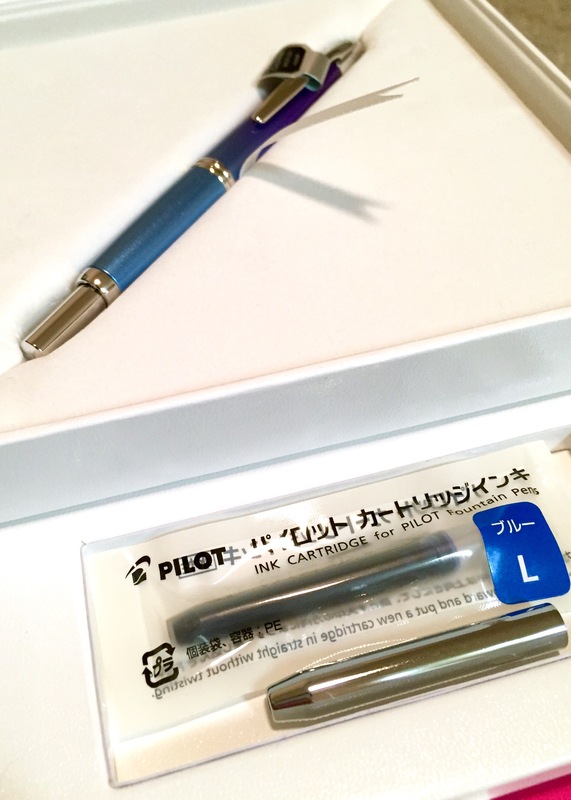 So I was delighted when JetPens sent me one free of charge to try out. When you see the word “CROCODILE” on a box, you either think of Steve Irwin or you’re thinking of some kind of eccentric piece of old lady accessory fashion. Thankfully, the crocodile pattern accent is totally tasteful, and nicely done—not some cheap sticker. The metal body is matte black (not the same matte black material as the Vanishing Point, so hopefully it won’t have that same problem), with an appreciable little bit of weight to it. 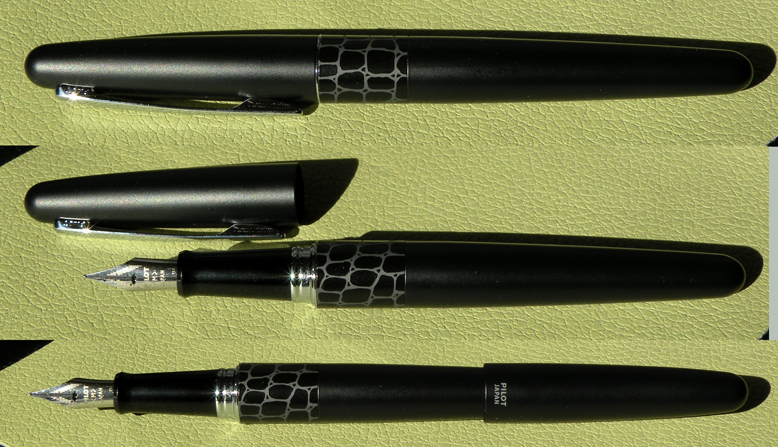 In terms of appearance, it’s a lot like the Sheaffer VFM—an attractive, modern, minimalist black pen. Sometimes I wish I was a fancy businessperson with a briefcase. I would put this pen in my briefcase. For once, a treacherous, precipitous ridge at the grip lines up in such a way as to completely not affect me. But that edge might be a pain if it falls on a delicate part of your grip. Now, where do I buy other nibs for this? 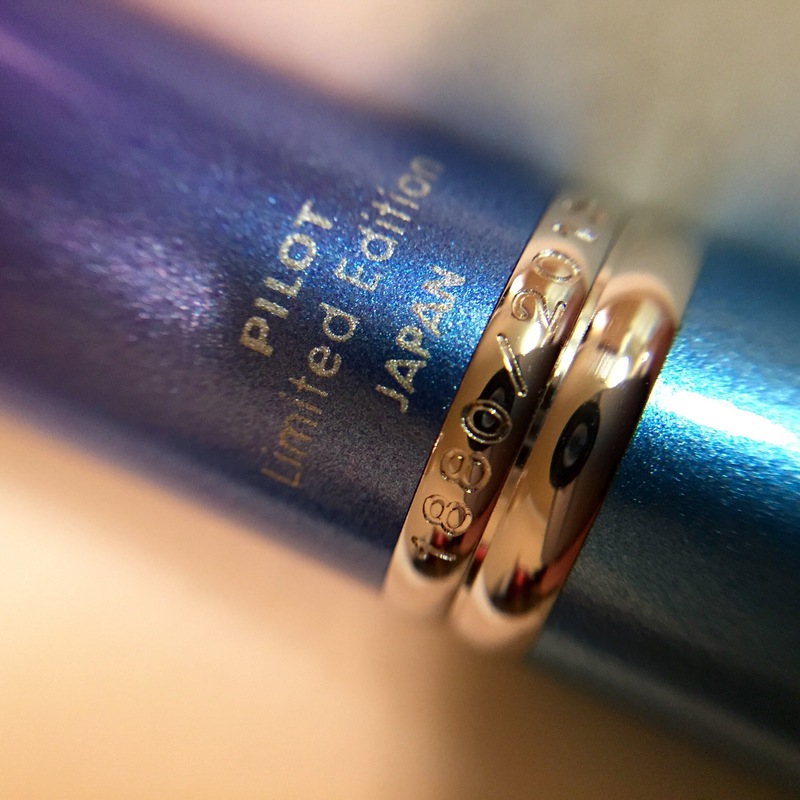 The writing on the Metropolitan is really stand out. I had no trouble getting it started, and the flow is great—juicy but not too juicy. 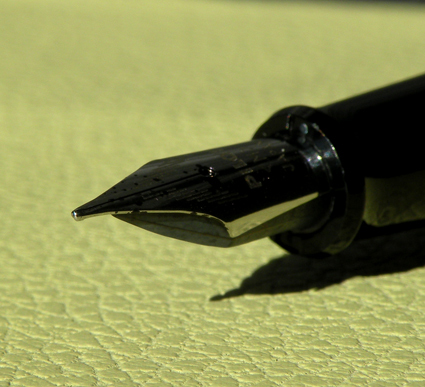 The medium nib is true to the same size medium lines laid down by the Pilot Vanishing Point. 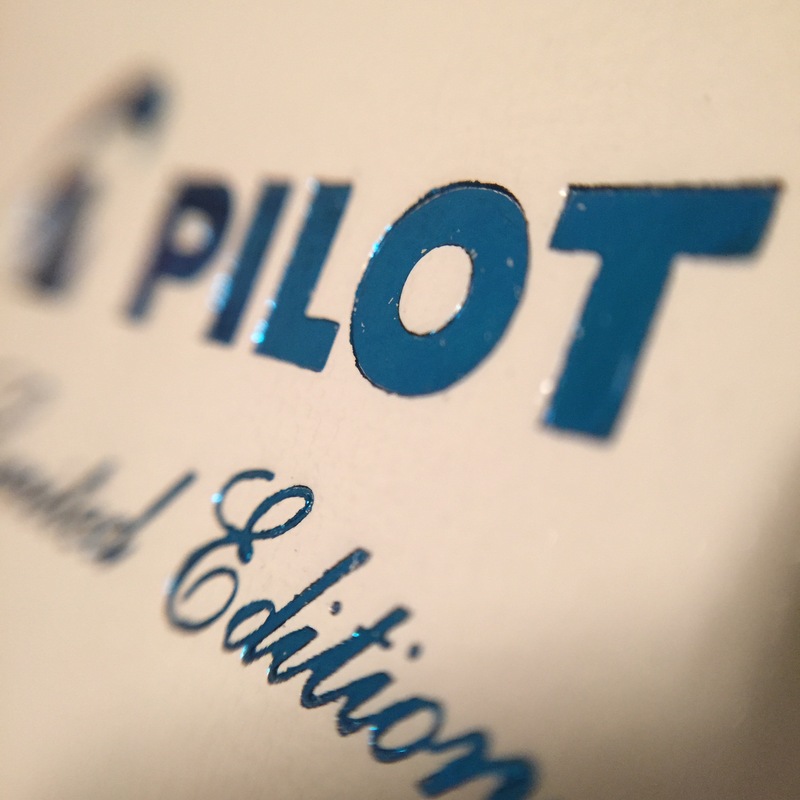 I am not familiar with this style of Pilot nib (I know the cheapo nib used on the Varsity and the Petit 1 (unique in its ability to fuzz and feather on nearly any paper); the Super Quality style used on the Plumix, Penmanship, and Prera; and the gold Vanishing Point nibs). 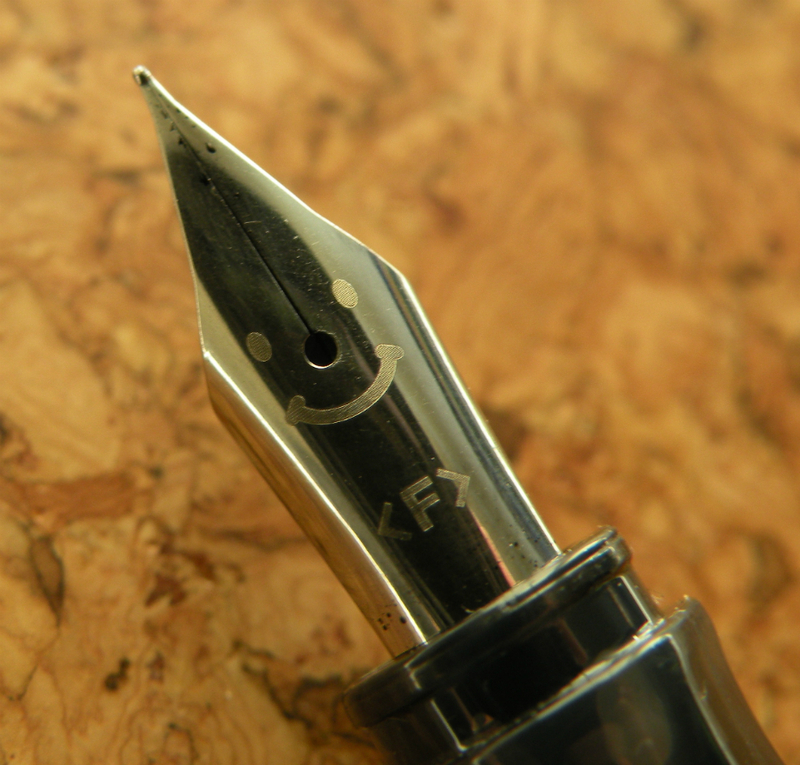 This nib is new to me, and it’s pretty great. The sweet spot is oh-so-sweet, a whisperingly smooth tactile nib skating along the page. 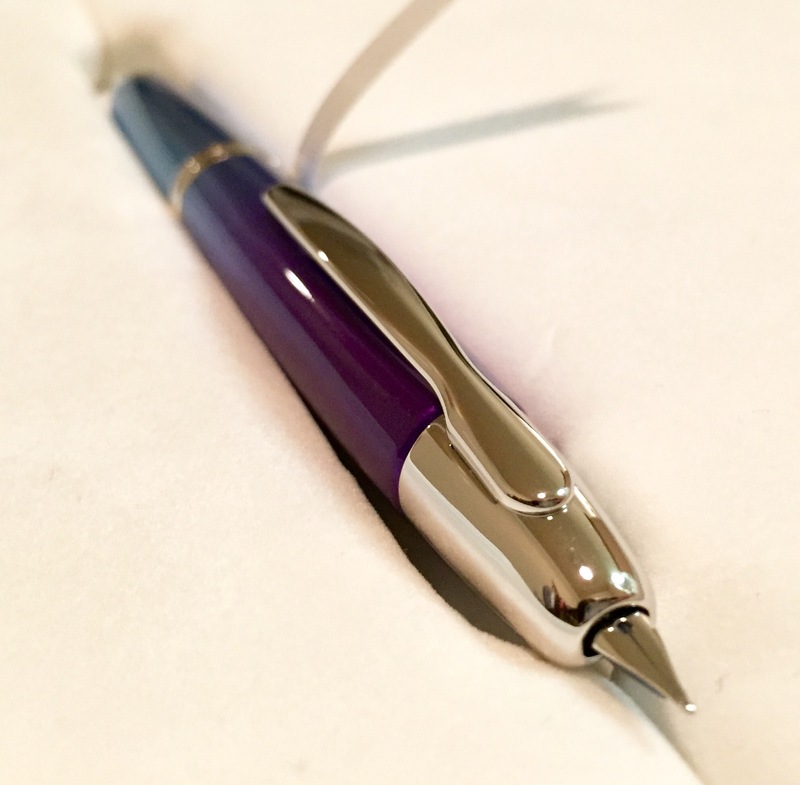 Pros of the Metropolitan: great writing performance, quality build, round grip, metal body, and comes in different colors and accent patterns. 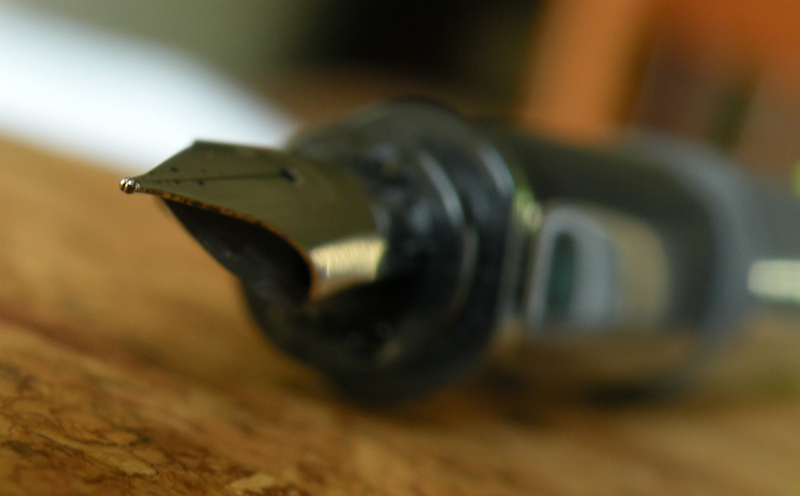 Cons: medium nib only (though I’d bet other steel Pilot nibs can be swapped on), proprietary cartridges (but it did come with a converter for bottled ink use). 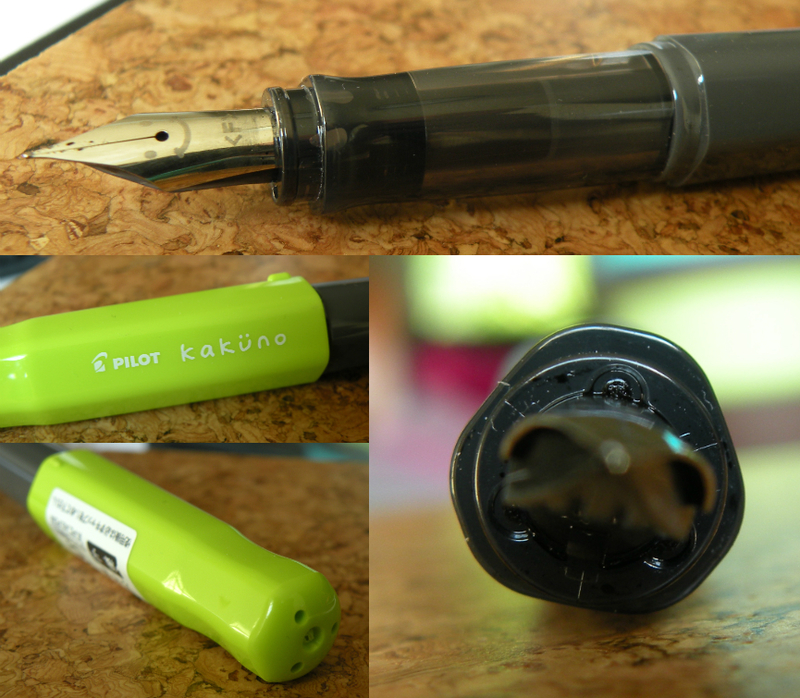 This is another great under $30 entry level fountain pen, or a great every-day-carry-around pen for the fancy collector who wants a knockabout pen that, if lost in the course of frequent daily use, wouldn’t induce a heart attack. 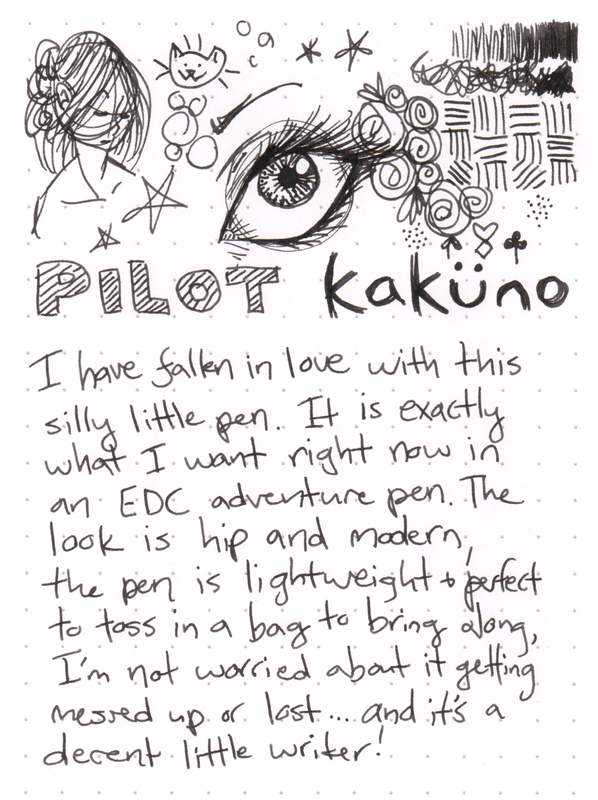 Thanks again to JetPens for providing this sample!